When I went on “cake hiatus” at the end of January, I still planned to make 2 cakes in the coming months. One will be for my sister’s bridal shower (which I am co-hosting) at the end of April. The other was for my friend Leslie who is expecting a baby girl in May (she’s due just 3 weeks before I am!). 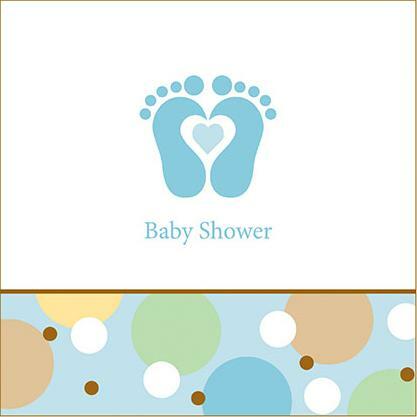 Her shower was this past weekend. 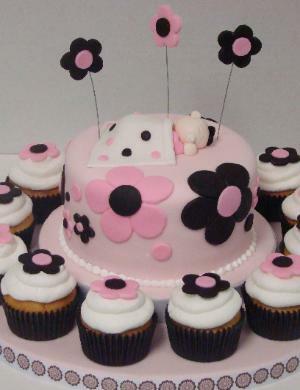 Leslie didn’t really have a “theme” for the baby’s room or anything so I Googled some pictures of pink baby shower cakes (no short supply of those) and got some ideas. I picked this one as my inspiration pic [source]. I really liked the display platform that this cake/cupcake combo was on. I don’t usually make anything special for the display, but for some reason I wanted to for this one. I used a 14″ round cake base for the larger bottom part, and I used 5 stacked 8″ round cake circles for the middle section. 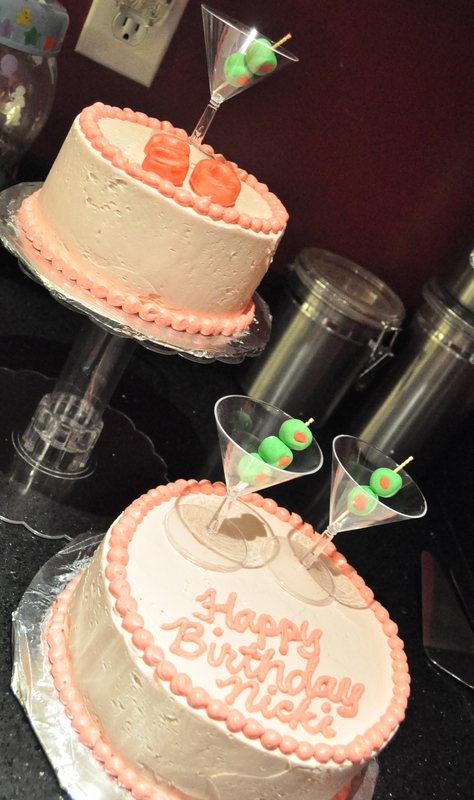 I used hot pink laminated paper for the top of the cake part, and I hot glued some green ribbon around the edges of it. Leslie said chocolate peanut butter was her favorite combo so I planned to do a vanilla cake with chocolate ganache filling and peanut butter icing. Due to a very, very busy week and weekend leading up to this shower, I decided to cheat and use a box mix for the cake. I made a 6″ round cake and 12 cupcakes. For the chocolate ganache filling, I used a recipe that I have used several times before. Though it was fudgy and delicious, I don’t think it was smooth enough. Maybe I didn’t mix it enough or maybe it was because I refrigerated it for awhile. For the peanut butter icing, I used a recipe from Annie’s Eats that I had been wanting to try for awhile. Peanut butter icing can be so rich, and this one looked lighter and fluffier so I wanted to give it a try. I thought it was delicious and very smooth and had a nice sheen to it. I thought it piped well on the cupcakes, but it was a little too thin for piping the border around the cake. It firmed up in the fridge though and it didn’t melt so overall it worked. I tinted some fondant using Wilton’s Pink and Leaf Green gel colors and cut out some flowers and circles to use for decorations. I also made little “lollipops” to spell out “Congrats Leslie” which I wasn’t sure would fit on such a small cake, but I managed to make it work. The cake that I worked on at the beginning of January was the most advanced order I have received to date. Meaning, I was asked and I agreed to do this cake about 5 months ago. I normally don’t take orders that far in advance, and I probably won’t in the future, but this one worked out well. Amy is a very old friend of mine from kindergarten all the way through high school graduation. We hadn’t really been in touch in the last 10 years or so, but that’s what Facebook is for, right? 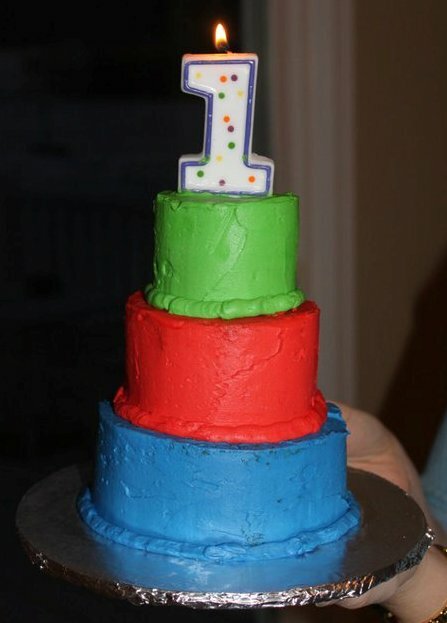 Amy asked me if I could make two cakes for her son, Brayden’s, first birthday party. 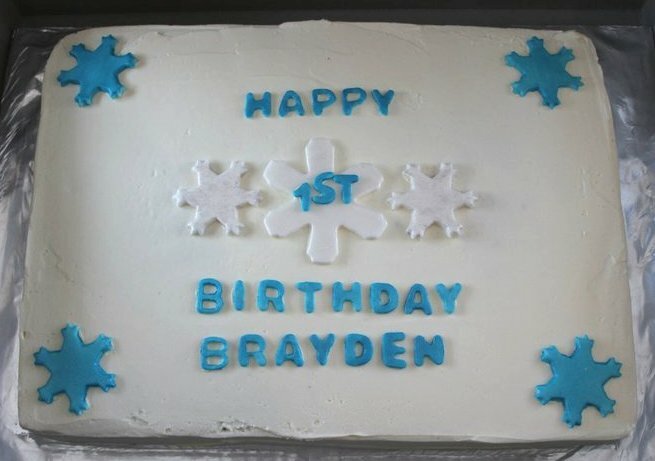 One cake would be a sheet cake for the adults, and the second cake would be a smash cake for Brayden. The theme for the party (and the adults’ cake) was mostly blue, silver, and white snowflakes. The cake was to be a half sheet cake – half chocolate cake with vanilla buttercream filling, and half yellow cake with chocolate buttercream filling. The whole thing would be covered in vanilla buttercream. I made two 11×15 cakes – one chocolate and one yellow – and then cut each one in half and filled it. I then pushed the two half cakes together to form the whole cake. I made a double batch of vanilla buttercream that I used to cover the cake and fill the chocolate half. For the decorations, I used two different snowflake cookie cutters to cut snowflakes out of plain white fondant. I used pearl dust and lemon extract to paint the snowflakes blue or white. I also cut out letters using my letter cutters. 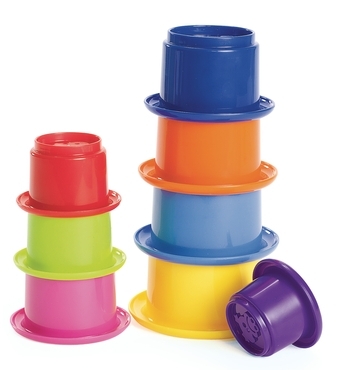 For the smash cake design, Amy sent me a picture of Brayden playing with his favorite toy – a set of nesting cups similar to the ones shown here [source]. She asked for the cake to be banana cake with vanilla buttercream icing and in the shape of this toy. I had never made a banana cake before, but I had a starred recipe in my Google Reader for banana cupcakes so I planned to use that recipe. The tricky part was figuring out how to get the shapes/sizes of cake I needed. I decided to make the cake 3 tiers – one 5″, one 4″, and one 3″ round. I could have purchased tiny cake pans or something for this, but I really didn’t want to add that expense since I wasn’t sure I’d have a use for them again. I ended up deciding to make two 10″ round cakes that I could then carve the pieces out of (I used a 1.5 batch of the cake batter). I had plenty of cake leftover, but this still seemed like the best way. My original plan was to somehow fashion giant “cookie cutters” out of heavy cardstock to use to cut out the circles. But as usual, my plans changed at the last minute. Paper didn’t look like it would work, so I ended up using a metal cookie cutter, a plastic 1 cup measuring cup, and the lid to a tub of butter. The cookie cutter was great because it sliced right through. For the others, I carved around them with a knife. I was thrilled to find out that not only did this banana cake taste amazing, but it was dense and super easy to carve – YAY!! This blog post is ridiculously late – it should have been posted about a month ago, but that just didn’t happen. But better late than never, right? My very good friend Nicki turned the big 3-0 in early November. She had a party at her home with a few friends to celebrate and I was more than happy to make her a cake for the occasion. Nicki is a cake lover and if we didn’t live 45 minutes away from each other I’m sure she’d be happy to take my “experiments” off my hands on a regular basis 🙂 But for her birthday we decided on her two favorite cake flavors: carrot cake and red velvet cake. Both would have a vanilla buttercream icing and filling. I made two separate cakes since carrot and red velvet don’t really go together. I ended up making an 8″ round carrot cake using my usual carrot cake recipe. I also made a 6″ round red velvet cake using a red velvet recipe that I had used once before for cupcakes (also for Nicki). I made a half recipe and I was delighted that it was the perfect amount for two 6″ round cake pans. The halved recipe called for 3 tbsp. of red food coloring and I had to skimp a little because my 1 oz. bottle, plus one of those tiny squeeze bottles (the ones that come in the 4 pack of liquid coloring) only yielded about 8 tsp. of coloring and that’s all I had on hand. But the cake was still decidedly red, so no harm done. For the “theme” we were going with martini glasses – inspired by the invitations for the event. I picked up some mini plastic martini glasses at Party City and I made some olives out of red and green fondant and skewered them on toothpicks. My original plan had been to make the numbers “3” and “0” and skewer them on the tooth picks with the olives, but it didn’t quite work out. So I just used the numbers for decoration on the smaller cake. I made two separate cakes since carrot and red velvet don’t really go together. I ended up making an 8″ round carrot cake using my usual carrot cake recipe. I also made a 6″ round red velvet cake using a red velvet recipe that I had used once before for cupcakes (also for Nicki). I made a half recipe and I was delighted that it was the perfect amount for two 6″ round cake pans. The halved recipe called for 3 tbsp. of red food coloring and I had to skimp a little because my 1 oz. bottle, plus one of those tiny squeeze bottles (the ones that come in the 4 pack of liquid coloring) only yielded about 8 tsp. of coloring. But the cake was still decidedly red, so no harm done. My friend Leslie asked me if I could make a cake for her friend’s baby shower, and I was happy to! The mom-to-be and her mother requested a chocolate chip cake with chocolate buttercream filling and vanilla buttercream icing. They also gave me the picture below as inspiration for the cake decoration. I made two 9×13 cakes that I would then stack to make a quarter sheet cake. I had made chocolate chip cake once before, but while that cake was good, it was SO buttery that the cupcake liners were greasy. I looked around for another recipe to try this time, but I had a hard time finding anything. I ended up using my normal yellow cake recipe and adding about a cup of mini chocolate chips to each cake. For the filling, I made a single batch of chocolate buttercream. For the icing I made a double batch of vanilla buttercream. I had plenty leftover but I prefer to have too much rather than too little! For the decorations, I made up 6 different colors of fondant (blue, green, yellow, tan, white, and brown). I used letter cutters for the inscription and circle cutters for the “bubbles”. For the feet, I enlarged the inspiration picture and printed out a copy. 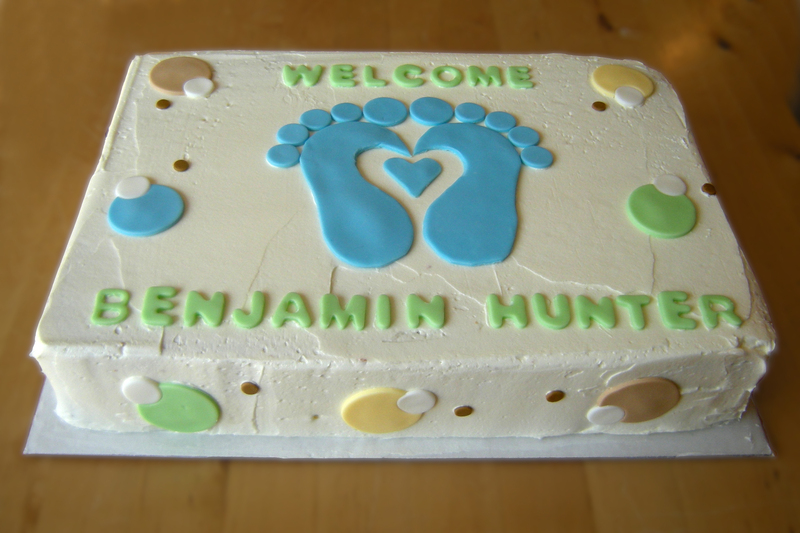 I cut out the feet and placed it over the rolled out fondant and cut around it. When Bill and I got married, we had his best friend’s mother, Janice, make our wedding cake and we loved it! So now, just about 2 years later, I was thrilled to be asked to make a birthday cake for Janice’s surprise 60th birthday party. 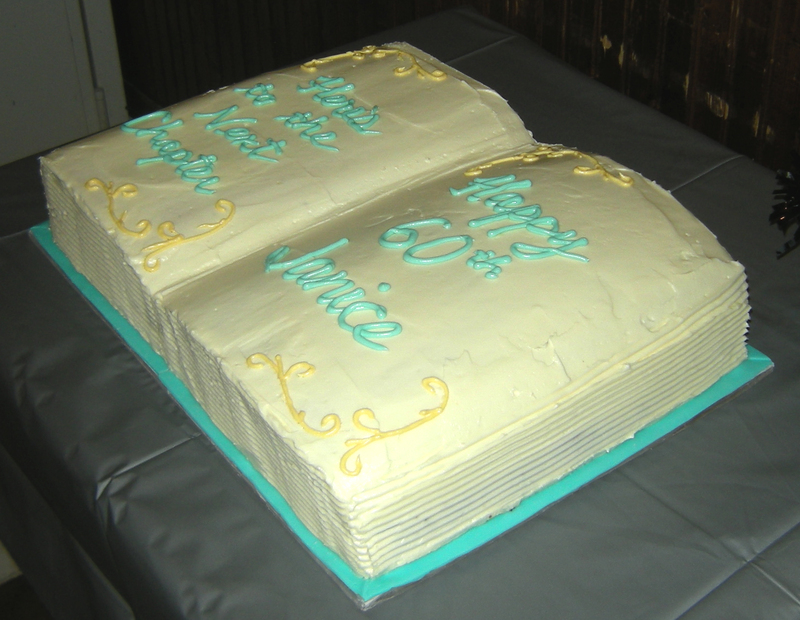 Valerie was making the arrangements for the cake and the design was going to be a full sheet cake, carved into the shape of an open book. Half of the cake would be chocolate and half yellow and it all would be covered in cream cheese icing. I’ve made a full sheet cake once before so this time I knew to allow plenty of time and as much space as I could. 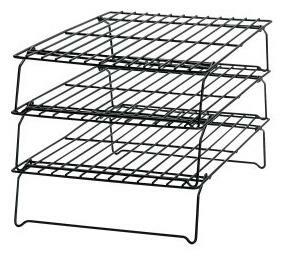 I also picked up this tiered cooling rack that really saved my life. Best $10 ever. For this size cake, I was going to make four 9×13 cakes that would then be stacked and pushed together to make one huge cake. The major issue I had last time was handling the cakes – flipping them out, cooling them, moving them, etc. But this rack really helped me! I made this cake over the course of 3 days. On the first night, I baked the cakes. I made 2 yellow cakes and 2 chocolate cakes. Each cake was a 1.5 recipe, so a total of 6 batches of cake. This is the first time I ever wished for 2 KA mixers! I did the chocolate cakes first and had one`batch in the mixer and one batch in a mixing bowl with my hand mixer. After they were baked and cooled, I did the yellow cakes. Five and a half hours later, it was 1:30am and I was done for the night. The next evening, I made a double batch of cream cheese frosting. I filled the cakes, stacked them, and pushed them together to make a 12×18 sheet. Next up was carving this into the shape of an open book. I found a few inspiration pictures on the web and I even grabbed a large book off my shelf and opened it up to get a good idea. I was nervous about the carving because I didn’t want to over-carve and be left with a too-small cake! After I got it into a good shape, I covered it with a crumb coat of icing and put it in the fridge overnight. The next morning, I made a triple batch of cream cheese frosting and covered the cake. I used an icing comb like this one [credit] around the edges of the book to make the “pages”. It was a little tricky because I had to have the icing thick enough so that the comb wouldn’t scrape too much and show the cake, but I only had a half inch edge on my cake board to work with. After the cake was iced, I tinted some fondant using Teal gel and rolled out some thin strips. 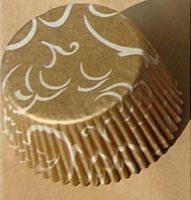 I put these around the edges of the cake directly on the board – they were the “cover” of the book. Finally I tinted some of the left over icing using Teal, and some using Golden Yellow. I used a stencil to do the decorative swirls and then added the inscription. I was told that the cake went over well and it was delicious – which I’m always happy to hear!! After deciding on the wine theme, I went with maroon/wine, gold, and ivory for the color scheme. I made a 6″ round chocolate cake and filled and covered it with cream cheese frosting. The cupcakes were yellow cake, also with cream cheese icing. I searched high and low for gold non-foil cupcake liners and finally ordered some from eBay (much to my husband’s amusement). I happened to pickup some gold sprinkles in the grocery store that I used on the cupcakes and around the edges of the cake as confetti. For the fondant decorations, I used a combination of Red-Red, Burgundy, and Black Wilton gel colors to tint the fondant. I was going for a dark red color (similar to this that I did with Red-Red- and Burgundy) but this time it ended up a little more purple. 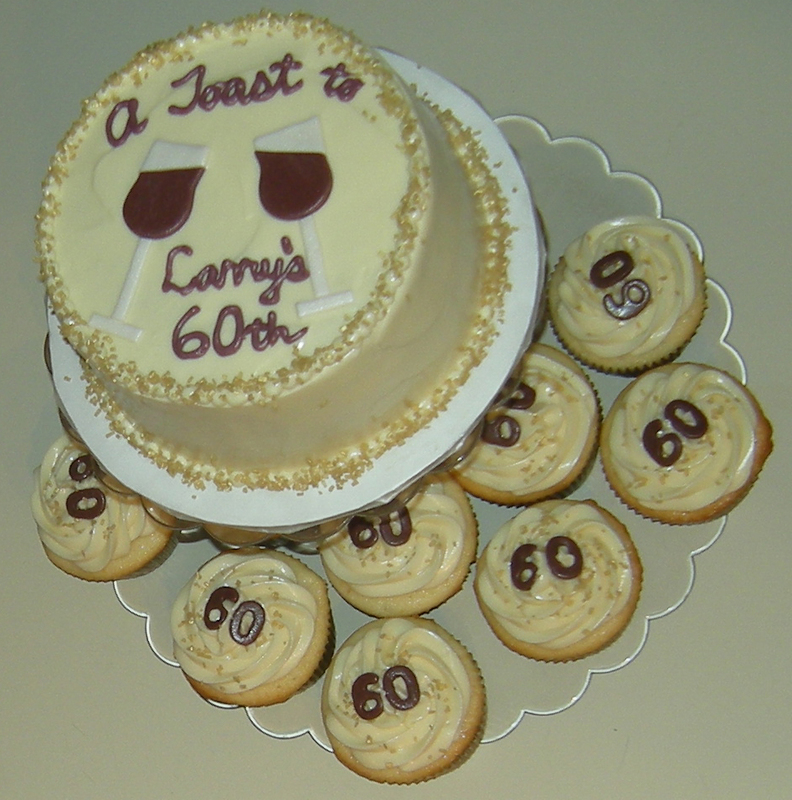 I used my fondant cutters to cut out little 60’s to top the cupcakes and I used a variety of cutters and a pizza wheel to make the wine glasses. For a little extra shimmer, I used a light painting of gold pearl luster dust. I tried gold, white, and red dust, but the gold looked best so I went with that. 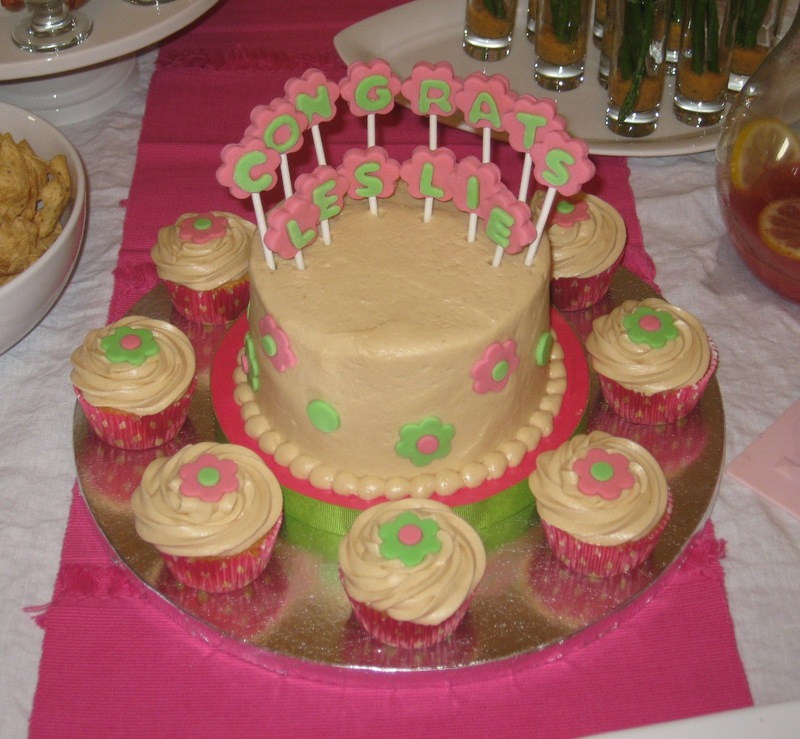 I was so happy to hear that the cake got rave reviews from the birthday party attendees! Saturday was my aunt, Nancy’s, birthday. She happened to be in town so we got to celebrate with her this year. My mom asked me to make a cake for her and I was happy to! 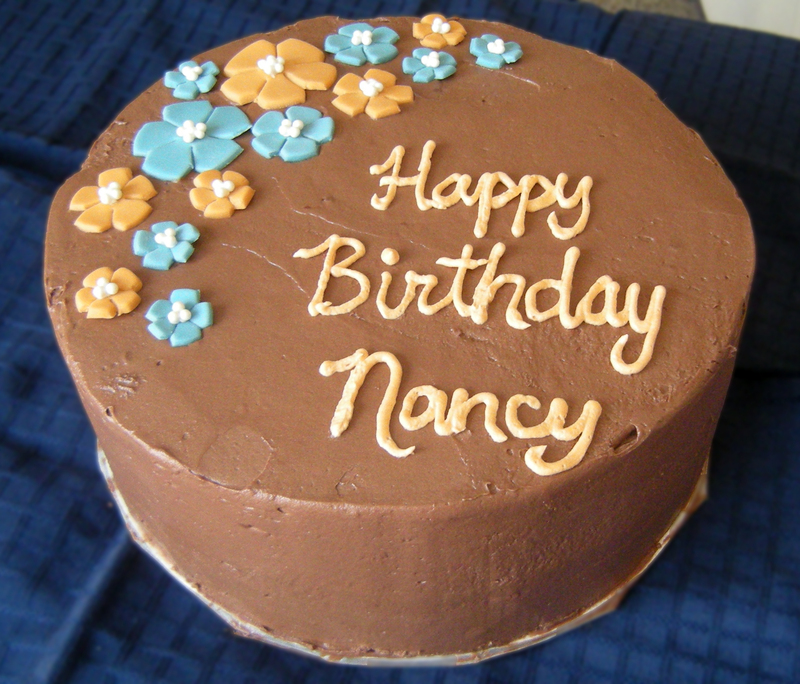 Nancy said yellow cake and chocolate frosting was her favorite, so that’s what I went for. 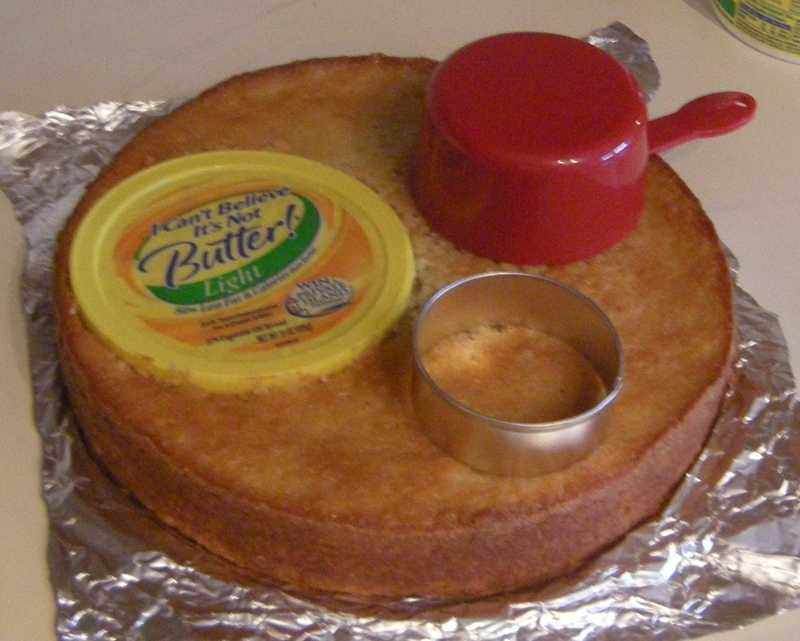 I made a 2 layer 8″ round cake with my go-to yellow cake recipe. The cake turned out a little dry this time so I’m thinking that I overcooked it slightly. It’s either that or the fact that I used whole milk instead of skim had some kind of effect. For the frosting, I made a chocolate buttercream. After icing the cake, I decided to try a technique called “the paper towel method”. 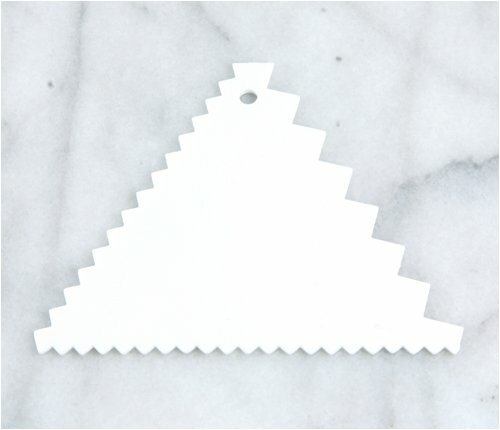 Using a non-patterned/textured paper towel (Viva brand) you lay the towel onto the crusted cake and basically iron it with a fondant smoother. I wasn’t pleased with the results. It did smooth any bumps or ridges out of the icing, but it made it look wrinkled – like elephant skin. I thought the icing that I’d done with my “putty knife” looked better. I’d like to try this again with a different icing recipe and see if that works better. But back to this cake. For the decorations, I tinted some fondant blue and orange and I cut out some flowers. For the white centers, I used some white pearl sprinkles and secured them with a tiny spot of white buttercream. You are currently browsing the archives for the Wilton fondant category.